Country Meadows Organics mainly grows heirloom vegetables, specializing in heirloom tomatoes. They like to grow vegetables known for their exquisite taste, and vegetables that aren’t available commercially. Crops change year over year depending on the weather conditions and availability of seeds. Tomatoes are their biggest crop. With over 60 varieties, there’s a tomato for every taste. 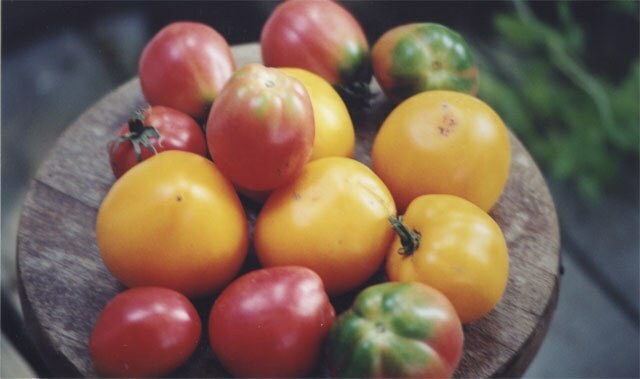 From the very little Tiny Tim cherry type tomato, to the Great White or the Mammoth Creten, weighing 2 – 3 pounds, or the fabulous Cherokee Purple from native North American, we have tomatoes of all sizes, shapes and colours. Country Meadows Organics also grows lemon cucumbers, white cucumbers, Chinese cucumbers, traditional English cucumbers, blue potatoes, purple carrots, and the list goes on… They also sell their certified organic seeds, started plants, and vegetables at farmer markets across the GTA. The farm also has heritage breeds of chickens, mainly Silver Lace Wyandottes , Buff Orpingtons, and Silkies. Their herd of goats has been with the farm since before they moved to Queensville (keeping the goats away from the gardens often proves challenging 🙂 ). The flowerbeds consist mainly of native plants. This is for two reasons. Native plants are suited to our climate, so are easier to grow, plus they attract butterflies and birds. Nature plays a very big part in organic gardening. Without our friends the birds, bats, toads, garden snakes, praying mantis, and other beneficial insects, they would never be able to have the fabulous organic gardens that they are so proud of. In fact, at Country Meadows Organics, nature rules. Email Country Meadows Organics to find out availability and where to buy from them. Note: Country Meadow Organics does not sell from the farm and they are not open to the public.